I have to be honest here: I am SO not a morning person. I’m a night owl, and an insomniac much of the time, and when the sun rises in the morning, I just want to stay under the covers for another few hours. So needless to say, I get out of bed at the last possible minute – which doesn’t always leave a lot of time for morning yoga, or breakfast. On mornings that I’m at home, I just take my time and eat a late breakfast as I go about my day. But when we need to be somewhere, I have to either starve till lunch (not a good idea for my sanity nor my metabolism) or plan something quick, easy and nutritious in advance. 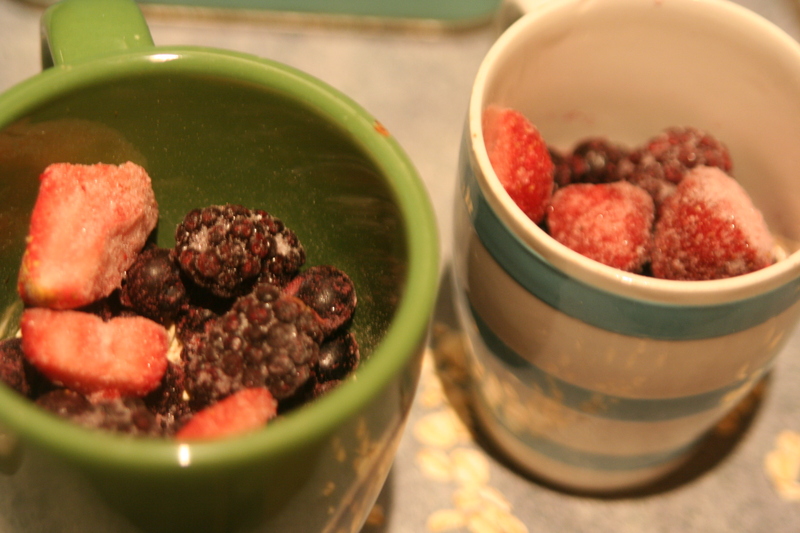 Last spring while I was participating in the X-Weighted Challenge, an online friend that I met there suggested dry oatmeal, covered with frozen berries and left overnight to thaw. She’d been turned on to the idea by a personal trainer friend. 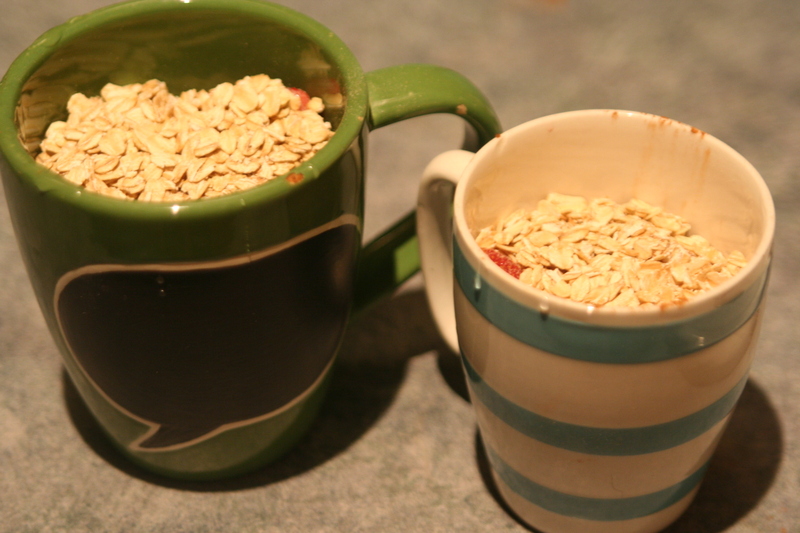 This is quick, easy, and quickly became a new favourite breakfast in our house! It takes less than five minutes the night before, we always have the needed ingredients on hand, and is ready as soon as you roll, bleary-eyed, out of bed in the morning. And it packs a big hit of fibre and antioxidants! 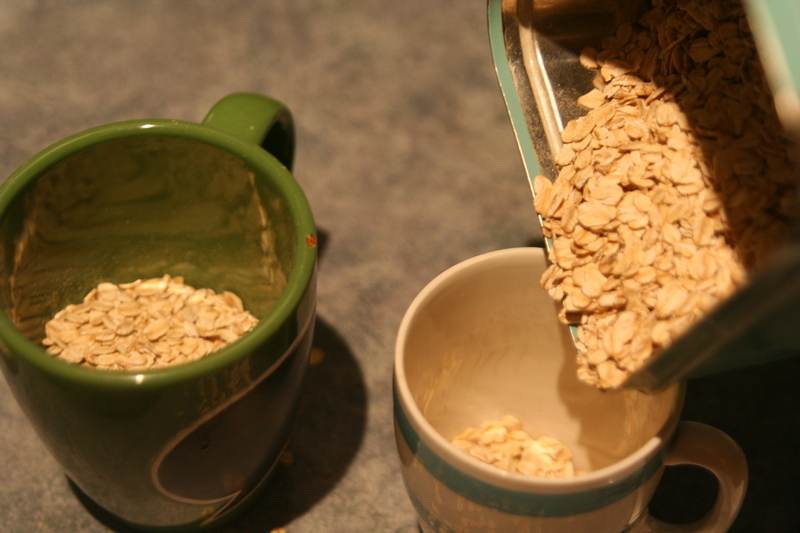 Fill cup about 1/3 with dry oatmeal (I use slow cooking oats). Added frozen, mixed berries to about another 1/3. 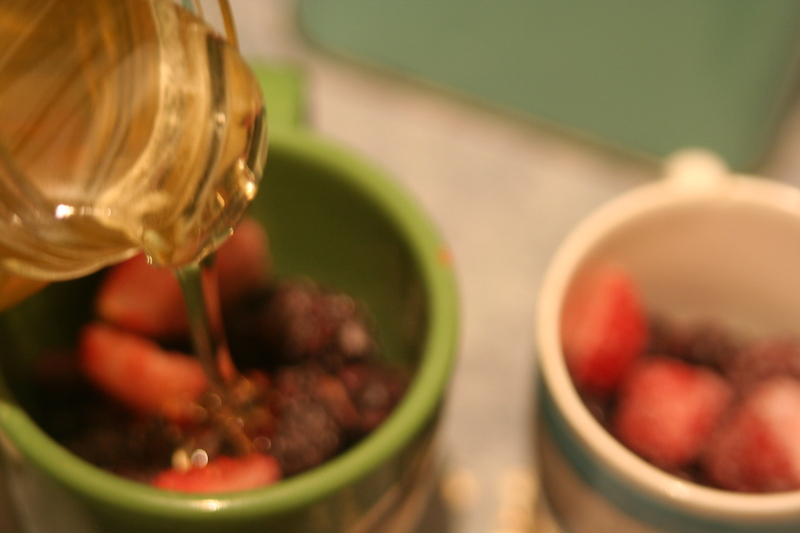 Add a drizzle of sweetener – preferably maple syrup, though clover honey is shown. Give a generous dose of cinnamon on top of the sweetener. Cover with more oats, leaving room to mix; cover and let sit until morning. The next morning – Enjoy! 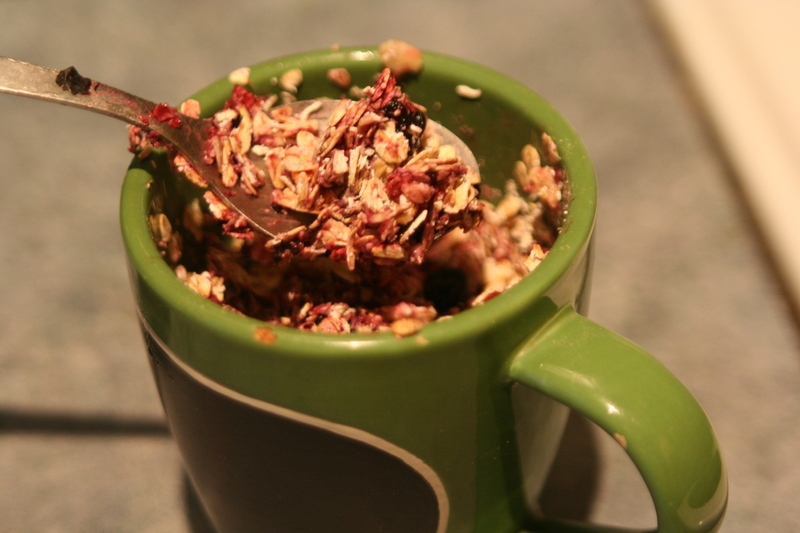 Take a big spoon and really stab it down into the oatmeal to break up the berries and mix everything together. Make sure you get that dry oatmeal down at the bottom. The finished product after mixing thoroughly. What you’re left with is kind of a semi-cooked texture – like oatmeal but chewier, or granola but not as crunchy and sweet. It’s so good! Neko loves it, and so do I – and it gives me the energy to get through my day.